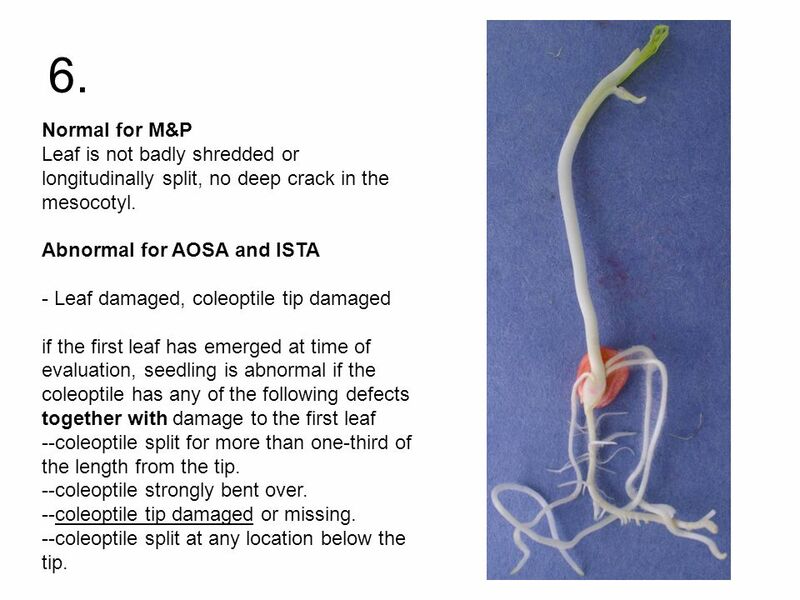 In accordance with M&P this would be classified as Normal Leaf is not badly shredded or longitudinally split There is not a deep open crack in the Mesocotyl AOSA and ISTA: Abnormal: Leaf damaged, coleoptile tip damaged and the coleoptile split more than 1/3 of the length from the tip. 4 2. 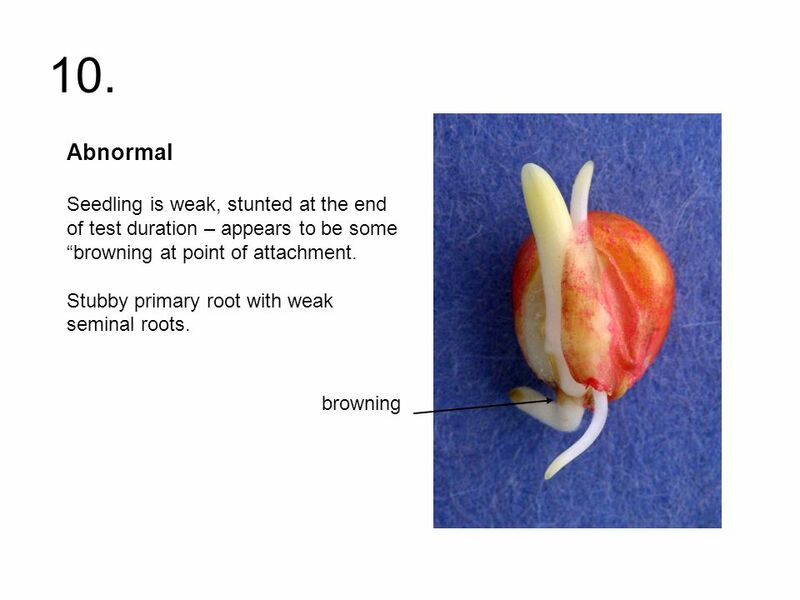 Abnormal: Missing primary root with weak seminal roots. 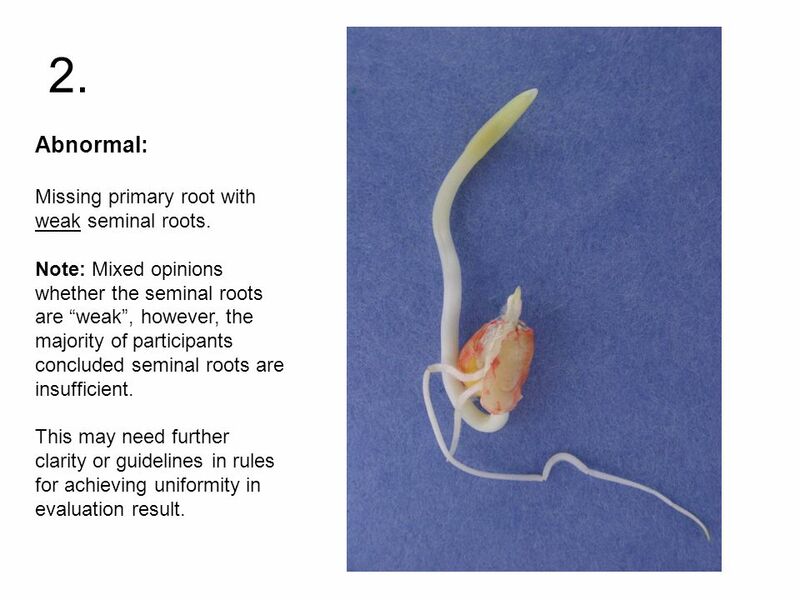 Note: Mixed opinions whether the seminal roots are “weak”, however, the majority of participants concluded seminal roots are insufficient. 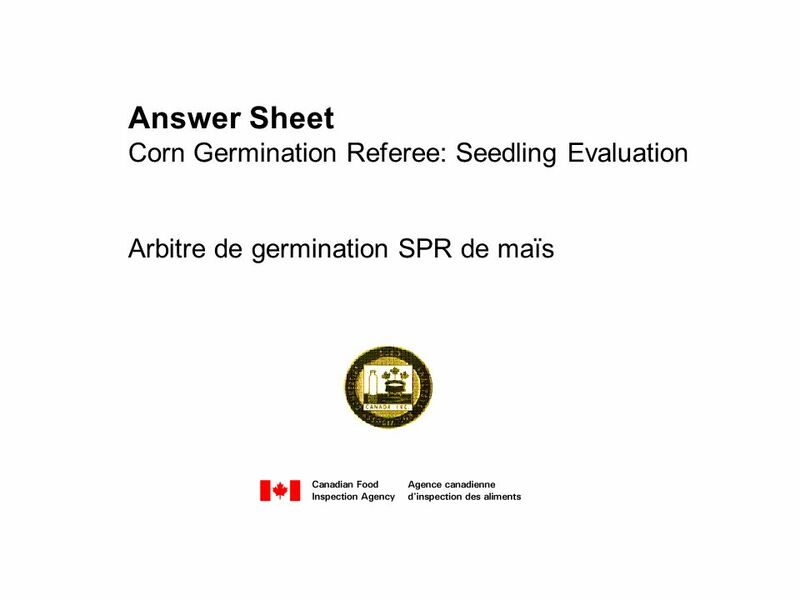 This may need further clarity or guidelines in rules for achieving uniformity in evaluation result. of the shoot system. 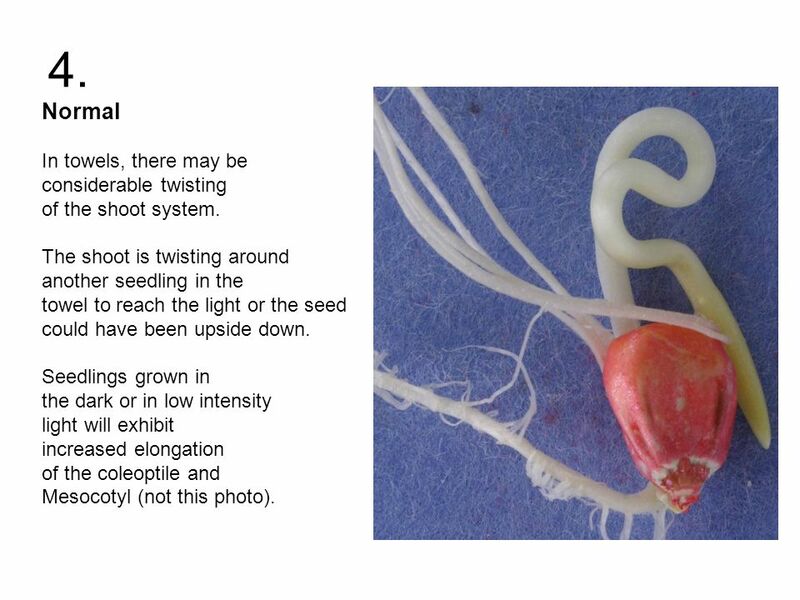 The shoot is twisting around another seedling in the towel to reach the light or the seed could have been upside down. 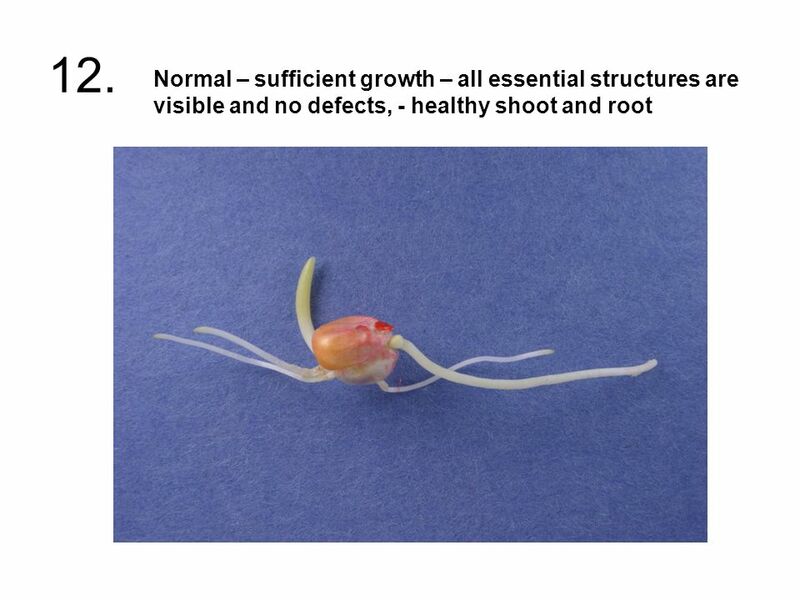 Seedlings grown in the dark or in low intensity light will exhibit increased elongation of the coleoptile and Mesocotyl (not this photo). 7 5. 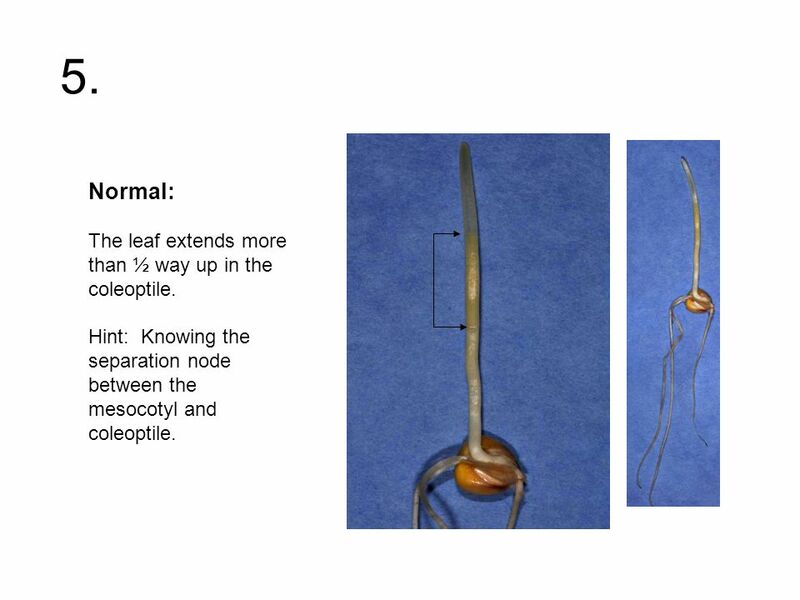 Normal: The leaf extends more than ½ way up in the coleoptile. 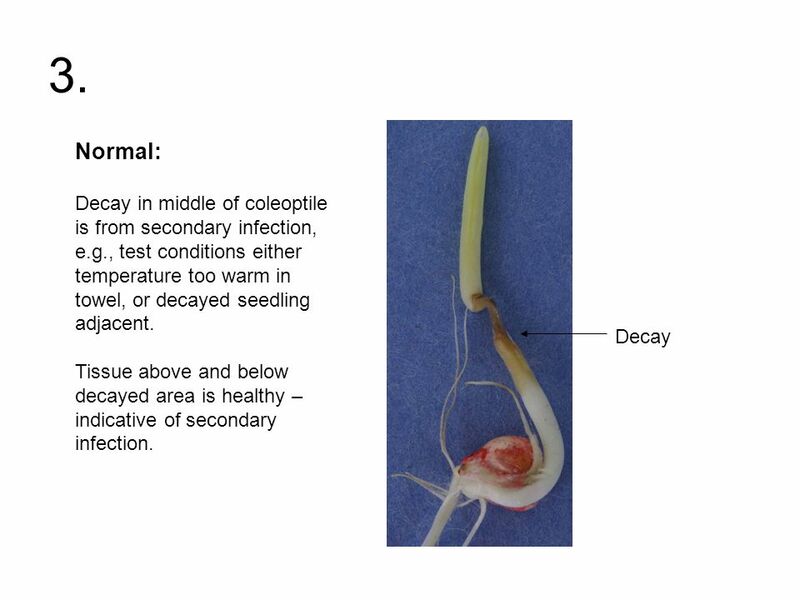 Hint: Knowing the separation node between the mesocotyl and coleoptile. 8 6. 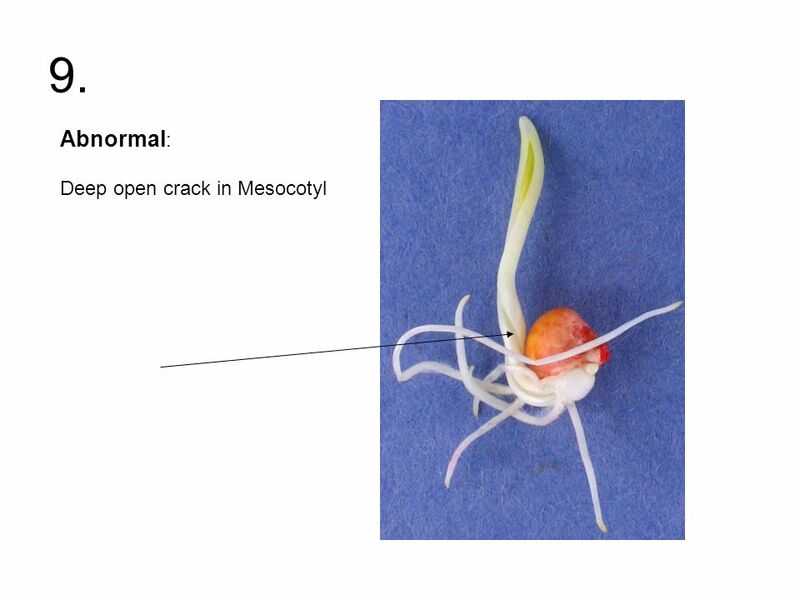 Normal for M&P Leaf is not badly shredded or longitudinally split, no deep crack in the mesocotyl. 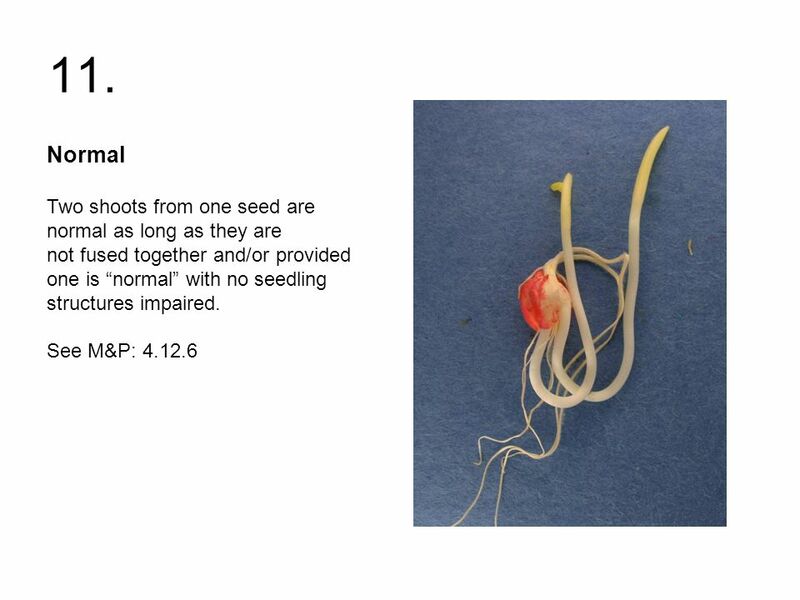 Abnormal for AOSA and ISTA - Leaf damaged, coleoptile tip damaged if the first leaf has emerged at time of evaluation, seedling is abnormal if the coleoptile has any of the following defects together with damage to the first leaf --coleoptile split for more than one-third of the length from the tip. 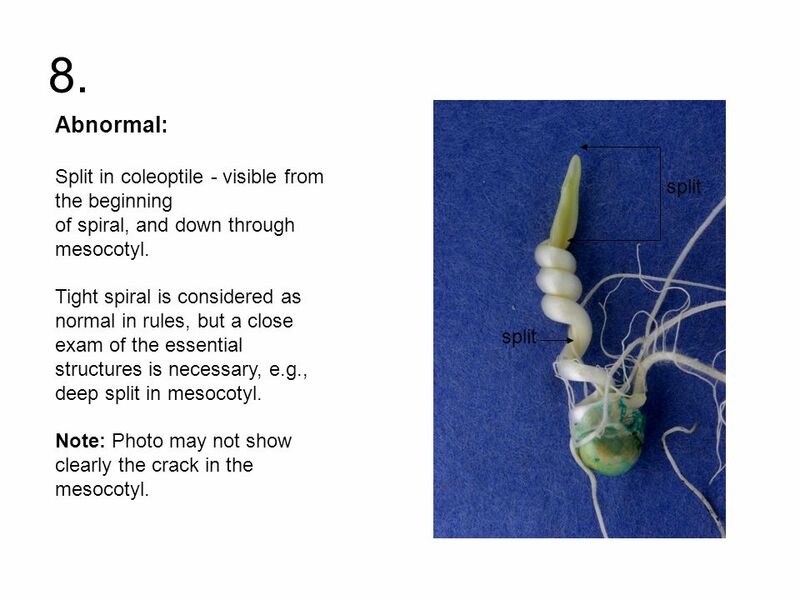 --coleoptile strongly bent over. --coleoptile tip damaged or missing. 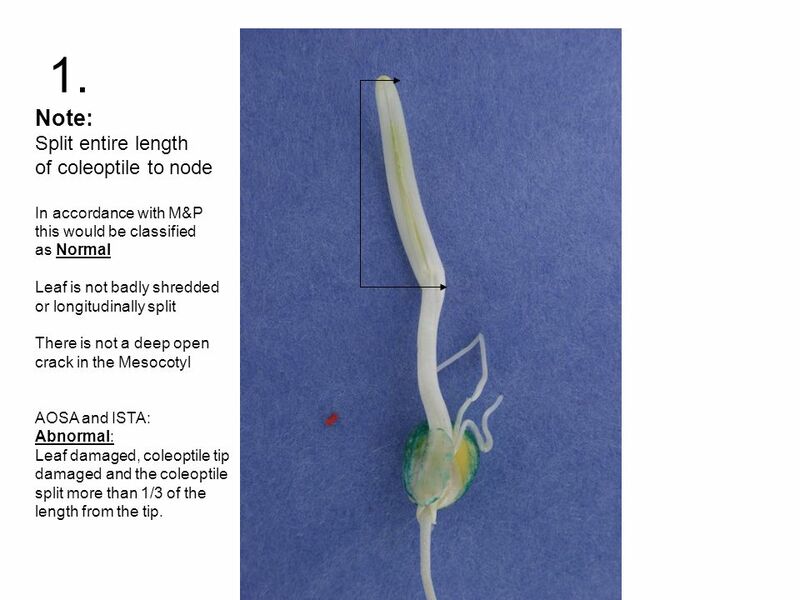 --coleoptile split at any location below the tip. 9 7. 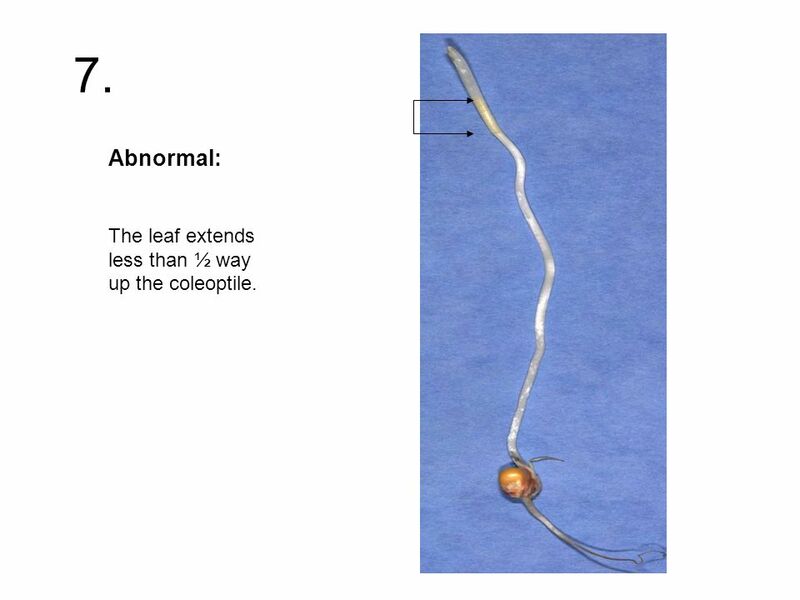 Abnormal: The leaf extends less than ½ way up the coleoptile. 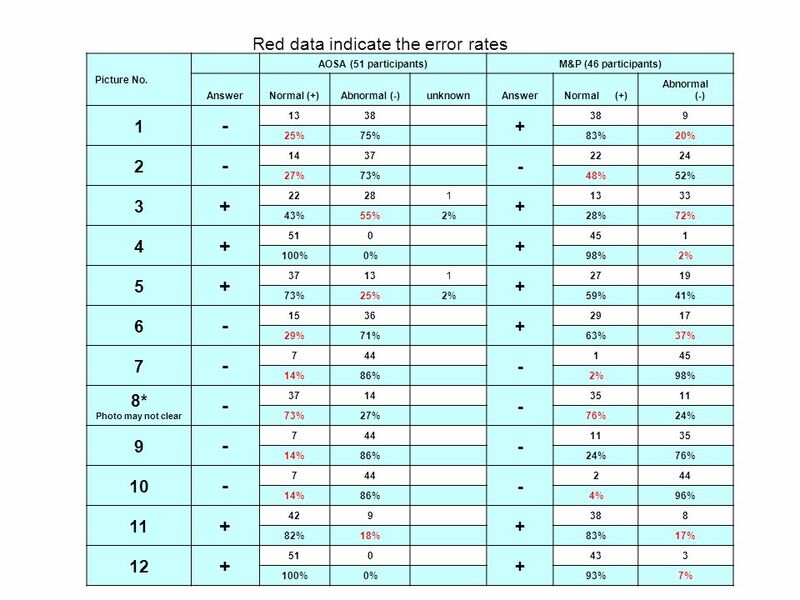 Download ppt "Red data indicate the error rates"